4:40am. It was still dark as my alarms goes off. I turned it off, go pee, and crawl back to bed under the soft, warm bed sheets. 4:50am. The alarm called me again. I turned it off and continued to lay in bed. 4:58am. I dragged myself to the bathroom to take a shower. 5:20am. William got up and took a shower. Once I was fully awake, I packed my extra clothes and made some oatmeal for both of us. I was actually not nervous about the race yet. Just very sleepy. We left the house at about 5:50am to pick up our last trooper Mike. 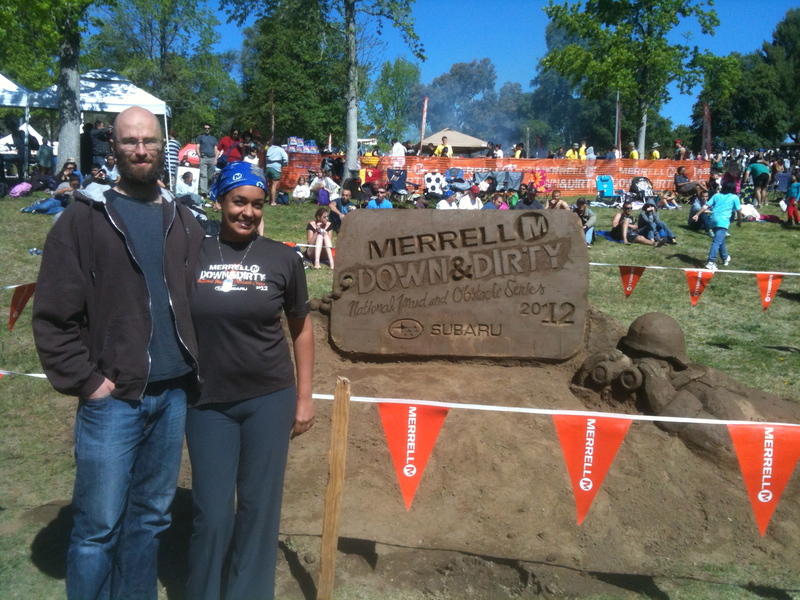 As you all know from previous blogs, I’ve used this past week to prep myself for the Merrel Down & Dirty. This whole year I have been running with the exceptions of some gaps in February and March. Then there is Mike. Mike is one of William’s friends that has never ran or done any exercise. He plays baseball in a local league and that’s about it. He has been hearing about our experiences and William’s marathons for a quite a while and finally decided to commit to a challenge. However before today, he had only worked out for about 1 week and a half. He just bought a membership at the gym and has tried to get himself in shape this past week for this race. William and I both knew that this was going to be very tough for him but all agreed that we would stick together and help each other get through the race. We arrive at Castaic Lake early enough to check in, stretch and get our body somewhat loose. It was very cold and we did not have the courage to take our sweatshirts off at first. We left them on until about 7:45am when we had to check in our bags. 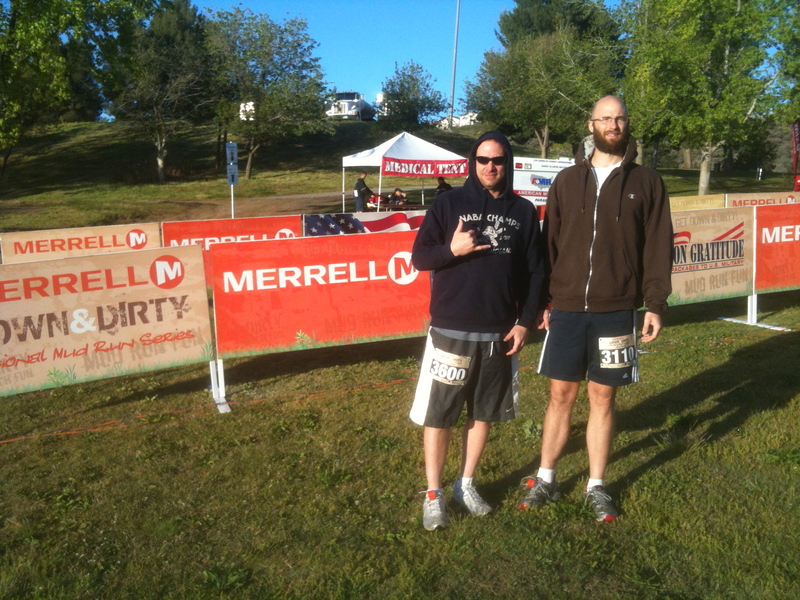 We then headed to the starting line right before 8:00am. We decided to go into the first wave possible. Why not! At this point I was eager and excited. It was not until the gun went off and we started to run is when I felt nervous. The first half a mile was cold and all I was trying to do was to warm up and create a nice slow pace to start easy. I wanted to conquer this race and I wanted to push myself. The first few obstacles were easy. We had to go under nets and sure enough the steady incline began. The hills had started. I tried to keep myself at a good pace and for the most part it worked. After the first hill we had to do 10 push ups. I have not done any for quite a while but still got down and heard Tony Horton’s voice in my head, “Do your best and forget the rest.” So I did and gave the hills 10 push ups. There were some areas where I had to power walk up the hills. Mike immediately in the first mile was out of breath and sweaty. William and I kept ourselves near him so we would not lose him. Mile two came fast and for the most part we running uphill until mile three. The obstacles that we had were actually pretty easy. There was one where we had to climb up some walls and crawl in tunnels and under nets, and also climb some nets. At once point we had to walk on lumber strips that were very wobbly. It was not a good idea to balance yourself on these when other people were on them. If someone fell of these, it looked like it would be very painful. There were volunteers there helping you but I did not want any help. I wanted to walk on these without any help. The yoga kicked in and I walked on them without any problems. During this time Mike was a real trooper cracking jokes trying to stay alive. Early in the race his lower pack was giving him problems. We stretched out our hamstrings a few times during the course to help out his back and it seemed to help him quite a bit. 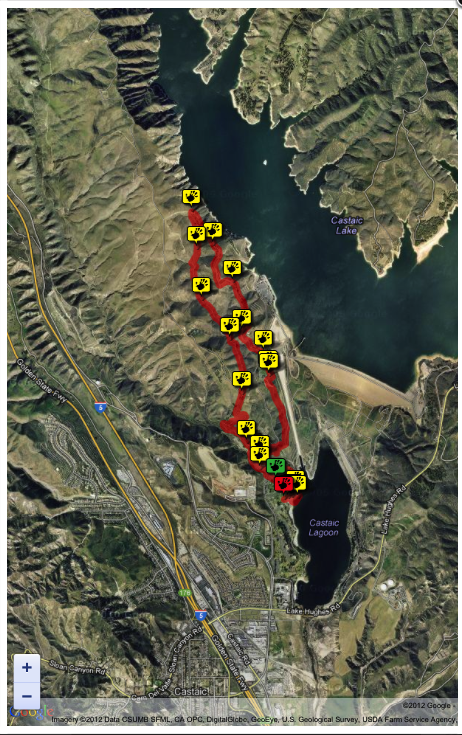 Third mile had a nice view of the Castaic Lake. We were probably at the highest of out those hills and the scenery was very beautiful. By this time, the day was not as cold, the shine was bright, and we were enjoying ourselves on this picture-perfect day. At some point in the fourth mile, the first mud lake was to be accomplished. We had to crawl in mud and the water was very cold. After the crawling, my clothes became heavy with mud but it was not as bad as I thought it would be. Once you kept running, nothing mattered. I kept thinking of Tony Horton’s P90x phrase, “Do your best and forget the rest.” That’s what I was trying to be the whole time. I tried my best and did not think of anything else but the enjoyment of the whole race. The fifth mile was probably my favorite. This mile was already going downhill. It was basically a trail with many switchbacks and nice scenery. The sixth mile was back at the recreation area back to the event where it started. The only other obstacle that stood out for me was the “slippery mountain.” It was where you had to pull yourself up with a rope not using your feet and knees. It was difficult for me because I still cannot pull my whole weight yet and also one of my pinky fingers is injured so it was hard to grip the rope with my hand without causing pain on my finger. William and Mike both helped me get through this one. 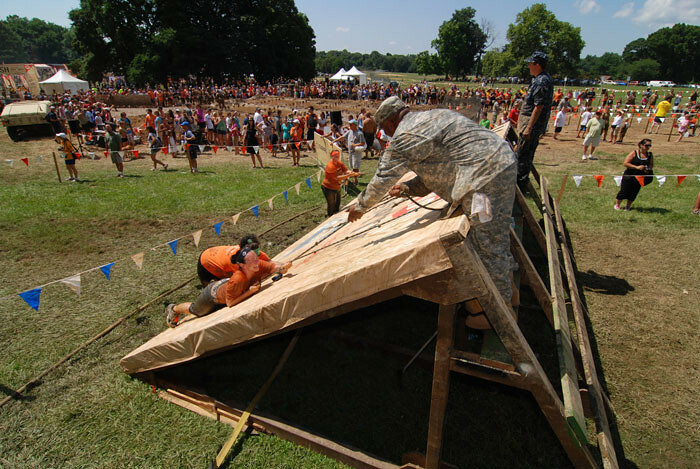 The last obstacle was the big mud pit. It was not so bad and I unlike the others tried to keep my face away from the mud. William went in there like a beast and crawled that pit very quickly. Mike did the same thing too. The bottom of the bit was rough with rocks and rubbed on my knees. 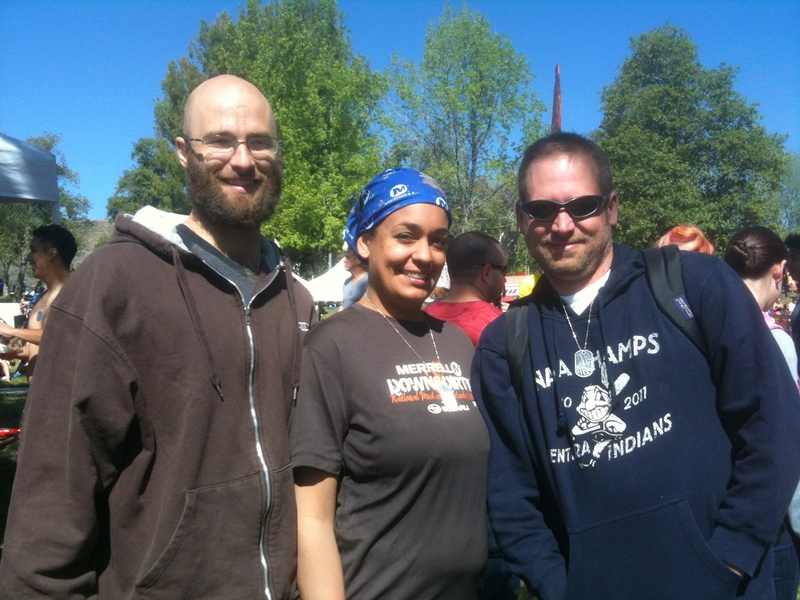 All three of us crossed the finish line together. It felt great to finish and finally get this race out of the way. We were muddy and very happy. We then showered in cold water and changed clothes and had a hamburger. The above picture was after we were dry and changed. You can see some mud on our faces. We did not have our cameras right after the race when we were full of mud but I’m sure some will show up soon on their website. Tuesday I was pretty sore from the hills from the night before. After work, William and I decided to bike to a local park and shoot some hoops. It was a great way to loosen up the body after a long run the night before. We then biked home after spending some time in the basketball court. Wednesday I woke up more sore and decided not to do anything after work. I met up with my friend after work at Pink Taco’s and had some appetizers and two cocktails. I made it back home not too late and did not think much of it. It wasn’t until after work today that I realized I was very tired. 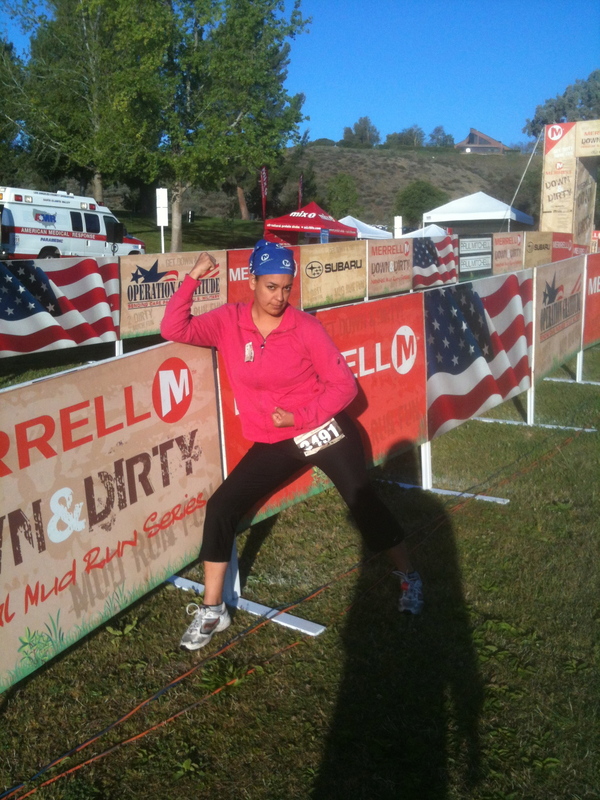 I knew I needed to make time to run because at this point, I’m only three days away from Merrel Down and Dirty. William was already home when I arrived because he had bike to and from work. It was a total of about 25 miles of biking. There was no way I was going to make an excuse not to run after he biked that much in one day. So there I went and started my run to Avenue 50. Immediately after I started I felt very heavy and tight. I felt I was running very slow. The whole run felt this way. My legs very tight. After running 1.5 miles, I decided to stretch my legs to see it would help. It really did not help but I kept pushing myself. I made it all the way to the other side of the 110 freeway through the bridge and then down Griffin Street. I ran uphill a few times and it felt more difficult than Monday’s run. On the way back to my house is when I started to walk a lot. My legs were not keeping up with me! I took me 36 minutes to run 3.10 miles. I should have finished quicker than that. My total distance was 4.6 miles. I won’t be running tomorrow because I will be working the whole day and night. I plan to do a morning hike on Saturday if it does not rain. I also have to stretch a lot more than just five minutes. My goal is to be able to run 13 miles by June. Tonight’s run was incredible. It was supposed to be a quick four mile run and it turned it to be six miles of exploration. I wanted to make sure I ran some hills since I’m only six days from the Merrel Down and Dirty . I hear that I’m going to be running hills so I’m very worried that I won’t be ready. I decided to take William for a run up Avenue 50 towards Figueroa Street and going towards my friend’s house in Montecito Heights. This was the bike ride I did on Sunday and so I figured it would be a good route to run. In general Highland Park (where I live) has a lot of hills so why not take advantage of them! The first 1.5 miles was running north on Avenue 50 up to Figueroa Street. It was basically the warm up but my calves were in so much pain! I guess the streets were bumpy and the little hills were killing me but I managed to to make it to Figueroa in 10 minutes and 21 seconds. We then made a left on Figueroa and ran through the Sycamore Grove Park, down a tunnel, up about 30 flights of stairs to run through the bridge over the 110 freeway and down to Griffin Avenue. William and I were so excited to go through different areas and off the main streets. We were supposed to run to Montecito Drive but instead William spotted a trail off to the side of Griffin Avenue. We decided to take it to see where it went. We were basically at the Ernest E. Debs Regional Park and were taking a trail up this hill. I tried to run must of it but then it became very steep. It was so steep that at one point we were climbing it. Mosquitoes were biting me and it started to get dark. William was already up the hill waiting for me of course. It took me a while to get up there and my calves were still hurting. I finally made it and I was in so much pain. But the view was very worth it. We made it up the hill just in time to see the sunset over the city. The purple skies were beautiful and priceless. I felt happy at that moment. After the top of the hill we decided to go run down another wider trail where it was not as steep. We assumed it would take us back towards the freeway and the bridge. We did end by the freeway but there was a fence blocking the road! We couldn’t get through unless we climbed the fence but it seemed so high. We decided to backtrack a little and take a turn towards another road. At this point it was already very dark and it was hard to see where we were going. We were stuck at this mountain and did not know how to get out of it. This new road that we took finally took us through the back of some houses and into a main street with a giant blue hornet. Very odd but it was there. We finally made it back to the city! We then realized that we were very close to my friend Carmen’s house. So we ran to her house and knocked on the door but nobody was home. We then ran back home which was the last 1.7 miles of our journey. I was so tired when I returned home but I was so happy that we did it. We ran and hiked around a total of six miles in about two hours.